Jennifer is a lifelong resident of Northern Virginia, growing up in McLean and graduating from James Madison University. Since 1997, Jennifer has had extensive involvement both on a professional level and now as a volunteer with the National Student Leadership Forum, where she has organized and led group discussions on leadership and action at state, regional and national events by bringing together members of both Houses of Congress, industry leaders, international government officials and professional athletes. Since she obtained her license in 1999, at the suggestion of her father, C.R. �Bud� Harper�a real estate veteran in the DC Metro area for 45+ years�she has gained the trust of her clients by valuing their individual interests and keeping the lines of communication open. In Jennifer�s 10+ years of experience, she has worked tirelessly to serve her clients with personal and professional integrity, attention to detail and unsurpassed dedication. Jennifer has developed a deep appreciation for building true relationships, which is now evident in the daily operations of her real estate business with a superb team surrounding her. 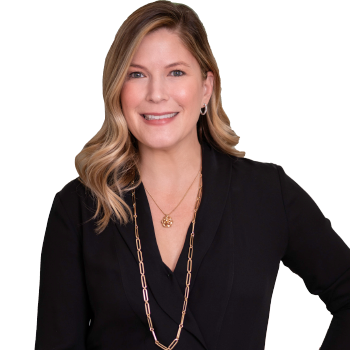 Jennifer also has extensive experience in new construction, having represented many builders both in land acquisition and sales. She has had personal experience with the process, having custom-built or extensively renovated three of her own family�s homes. In addition to her real estate career, her passion for family has led her and her husband Matt to adopt four young children, and, as a result, she is very involved in many school activities and committees, which has given her a unique read on the pulse of various neighborhoods, local private and public schools and their surrounding communities. Working with you and your team was a delight and continued to exceed our expectations every step along the way. We greatly appreciated your help in selling our home in West McLean. You provided us with expert advice on preparing and staging our home for sale, and your knowledge of the local market was spot on. We were unsure of the market and our ability to sell given these turbulent economic times. We had a contract on another piece of property and we needed to sell. You reassured us and provided realistic and straightforward advice regarding pricing and what condition our house needed be in to sell quickly in this market. Such information can make all the difference between "Sold" and "150 days on market." We are grateful we had you and your team on our side. We also found the professionalism of you and your team to be unsurpassed in the industry. We couldn't be happier with the entire transaction from your first walk-through of our house to the last signature at the closing table. At the end of the day, it all comes down to this�full-price offer within 24 hours of the first open house�you are a rock star!!! We would not hesitate to recommend you to anyone who is, or will be, in the real estate market in Northern Virginia. When we are ready to sell our next house, we will be calling on the expertise of you and your team to get it sold. Thank you so much for your outstanding work as my realtor on both the sale of my house in Great Falls and the purchase of my new home in McLean! Pertaining to the sale of the house, you gave me realistic counsel about pricing and timing—based on your thorough research and analysis of the market—so that I could make my decisions in an educated manner. You walked me through each step of the process—from advising me on how to stage my home to discussing altering marketing strategies as needed. You and your team make each client feel like a top priority! With regard to the purchase of my new home, I greatly appreciated the way you genuinely listened to my preferences and took them into consideration and didn't waste my time showing me homes that would not be of interest. I also felt like you were so well informed about the local market that you made me aware of new potential homes immediately. You and your team provide outstanding support, you are responsive and true to your word. I have had an excellent home sale and purchase experience and would highly recommend you to any of my friends or family. I just wanted to say thank you again for your help on selling Weaver. You identified an opening in the market, procured an unbelievable offer, went above and beyond with what you had to deal with (renovations, buyer and difficult tenant) and conducted yourselves with the utmost efficiency and professionalism. I can not thank you enough—you took the bull by the horns and got it done. My husband and I had the pleasure of working with one of your finest real estate brokers, Jennifer Harper-Thornett. We first met Jennifer at an open house in January. Her positive energy helped us decide that she would be the perfect person to assist us in finding a home in Virginia. Based on our first impression of Jennifer, she surpassed our expectations on all levels. She is smart, personable, professional and resourceful. Every telephone call and email was returned promptly. Bottom line—She made us feel special. Jennifer made our home purchase a delight. We never worried for a minute, knowing she and her assistant, Heather, were in charge of the transaction. What a great team! Washington Fine Properties is lucky to have someone like Jennifer. She is a true asset representing your company and we wouldn't hesitate to refer her to our friends and family or to use her again in the future.